One of the ways I deal with all the Schemes and Blueprint reading it has taken to pull together this story of the Common Core’s real aims or the CAGW hyping to cover all the meddling to gain a Crony economy based on Low Carbon or Green Growth or Sustainability–whatever this week’s buzz word is, is to retreat into history. Usually I try to read scholars who have been cited in those ever revealing footnotes in order to get to a “these are our intentions, this is who is involved” level of discussion. This blog is actually not Robin’s opinion for the most part. It is a searching out the actual facts in the relevant places where most people would never think to look. It’s impossible to read through the last several posts or the entirety of the blog and not recognize all these education reforms and the insistence on redesigning the economy under government direction and not think–“that’s Statism and aren’t we past the L’etat, c’est moi mentality of Louis XIV or a Stalin?” Well no, state control over people and natural resources for the benefit of the political class is actually the historical norm and we forget that at our peril. All the references to the Knowledge Society while actually trying to restrain any unapproved accurate knowledge and then calling it College Ready is par for the course. A common aspiration when the drive is towards organizing people and an economy around Statism. As an image of the palace at Versailles may remind you, Statism is oriented toward power-maximizing for politicians, public employees, and their Cronies. These can be Big Business wanting to protect their current revenue with no need to innovate. Or media seeking influence and access. Or foundations and colleges and universities all wanting to participate in the redirection of the future. For Statism to work, at least short term, it needs an ideology to march under–like Equity or Social Justice or Sustainability in a World at Grave Risk without Intervention. Check. Statism needs to keep going after an ever increasing number of subjects and issues to control and regulate. And it needs to go after its citizens at ever deeper levels of consciousness. Hence all the social and emotional emphasis with no lecturing unless it’s about a politically useful topic. Professor Manuel Castells commented on how the Soviet authorities were able to move away from submission due to outright terror to a passive routine based on “a lack of information and views of the world.” That appears to be the intended model for people all over the West in the 21st century. Use education “reform” to cultivate false beliefs, new values, different attitudes. The dominance of feelings and intuitions and impulse. The exact kind of initiative that enraged people in Hong Kong http://www.invisibleserfscollar.com/using-education-to-shut-down-free-choices-and-then-redefining-as-personal-autonomy-orwell-lives/ going on in the US or elsewhere but off our radar screen. The invisible aspect of the drive for power and control. “Responding to climate change also starts in the classroom. Education is the way to shape new ways of thinking and forge new sustainable behaviour. . .
Well, back in 2000 when the UK was in the midst of its controversial reforms in education that mirror what is going on in the US now, guess what? Teachers in the classroom were seen as the main impediment to creating “radical change.” That phrase “radical change” and the desire to control and alter the classroom interactions of teachers and students (sound familiar?) caused several papers and presentations by Barber and Vicki Phillips from our last post. Back then she was the School Superintendent in Lancaster, Pennsylvania but somehow she and Barber knew each other and were seeking to Unleash Irreversible Change-Lessons for the Future of System-Wide School Reform. Apparently their presentation style on how to win consent for Labour’s education programme was memorable because a description of it made it into a 2003 book. That is a mindset that appeals to political fanatics and greedy bureaucrats with a chip on their shoulders about their own childhoods. Or intimidates frightened teachers trying to keep their jobs. It makes promotion these days in education not about what teachers or administrators know or can do with students but what they are willing to impose on teachers and students. Well the Common Core implementation is overflowing with theories and blueprints in pursuit of political, social, and economic Transformation. At the level of the student. From the inside-out. The local results of the piloting districts have been miserable when not outright tragic. Yet still we proceed. By compulsion. Nationally and internationally. Political lesson not learned in the least. And no distance between theory and sought action at all. All That is Solid Melts Into Air–But Does It Really? That provocative image from a famous 19th century political theorist hoping for dramatic future change was also meant to Prime a Feeling for Planned Complete Transformation. Both within individuals at the level of conscious thought and society wide over time. The repeated and dire coordinated cries of the Ehrlichs and others of Danger, Danger unless We Change, Change appear to have the same impetus. Give up your right to make your own decisions and defer to Our Vision. It’s supposed to be a matter of necessity of course. Hence the hype. But the repeated push for Newmindedness that rejects rational thought and all the hyping of imminent unprovable global disaster sure is fortuitous. Especially when combined with a global vision of education that describes Foresight Intelligence as essential for transitioning to a Knowledge Society. While state-approved institutions seek to actively limit what anyone may really know. Methinks we are all being played here and the documents I have located certainly support that view. First the stated determination to “move us away from reliance on fossil fuels” will seem even more like a fantasy to shift us to a redesigned, state directed economy that benefits political favorites and Cronies after you read this December report “Humanity Unbound: How Fossil Fuels Saved Humanity from Nature and Nature from Humanity.” http://www.cato.org/publications/policy-analysis/humanity-unbound-how-fossil-fuels-saved-humanity-nature-nature-humanity . It details, for example, all the forest that would be gone now just to have an agricultural sector that could support our current population without fossil fuels. Something along the lines of the land mass of Canada, Latin America, and India. It’s a great overview but you simply cannot read it without recognizing that CAGW, the idea that there is substantial manmade global warming and it will prove catastrophic, is just an excuse. An excuse to gain widespread voluntary submission by ordinary people to an economy dominated by the Public Sector. Which means people who can be corrupted by conflicts are in charge and they have the power to tax, coerce, and compel. Paul Ehrlich and the UN and the European Union all want to push this idea of Foresight Intelligence as the goal of education. How would such a vision benefit them? Foresight Knowledge is about selling people on the idea that they should be thinking about Future Social Transformations so they can together debate its direction and shape the future. Now the 2006 document I located describing this Foresight process came from the Baltic region which remained under Soviet control until 1989. It thus described having to change people’s mindsets that together they could interact and develop a vision for future direction. The participatory aspect was a huge selling point for those with a history of subjugation by state decree. The flip side though of the Foresight collective decision-making process is the majority’s ability to bind everyone else to its vision guts the West’s vision of the primacy of the Individual. Personal decision-making freedom tossed away because of a perceived crisis. Plus the Imposed Vision is unlikely to actually be realizable. That’s particularly troubling when we think of a majority driven by emotion and false beliefs and new cultivated values as the education vision grounded in Outcomes Based education and social and emotional learning and the visual instead of the intellectual makes clear. In fact I have always found the use of the term Knowledge Society given all the official documentation and plans to limit anyone’s personal knowledge in the 21st century to be both a bad joke and cruelly ironic. It turns out to be a very good thing that I am both so suspicious and cynical and widely read on what is really going on. Because boy does the United Nations have plans for all of us while we are busy setting goals, interacting with each other and ICT generally, and pretending we get to set our own future courses. Right. Think of the Giant from Jack’s Beanstalk or Jabba the Hut gleefully rubbing their hands together while eyeing their captured prey. All the while repeating “You are Mine. Mine, All Mine” to appreciate what the bureaucrats and politicians have planned for us. After they use their monopoly over education to take out those Axemaker, rational minds and create an expectation that a majority can bind everyone else because it is now necessary to “save the world.” For the Future. Following up on Foresight Intelligence led me to a UN document from its Economic & Social Affairs division called “Understanding Knowledge Societies.” It’s not a 21st Century vision any of us are likely to be OK with but it is very real. And very grasping. At the level of “Right now, we do not have a unifying central cultural thought for humanity.” That would be what the 20th century called Ideology as a political organizing principle and it proved to be positively lethal on a mass scale. Having the UN push for “universal acceptance of the central cultural thought” (both quotes are from page 115) in the 21st is just not likely to go well either. Unless you have a job with the UN or a coordinating agency. Sounds like feelings and guessing and impressions to me. But we still have those no longer to be sanctioned Axemaker Minds unwarped by the planned daily immersion in ICT from an early age. And I don’t think the UN’s plan to have governments “reinvent themselves” to create “public value” is going to work well either. At least for us. No wonder the Statist Planners only want Tacit Knowledge among the masses. This is not really funny and I was clearly not on the approved list to see or read that document. C’est La Vie Schemers. Include me in that not going quietly into the Dark Night Brigade. As I said when we started this post all these visions being cultivated will not turn out as hoped for. But one thing will. This clear determination to make individual freedom and liberty a relic of the past will go as planned unless we quickly recognize that it is the mind the Schemers so want (bolding in original p 44) . And right now in K-12 and higher ed with preschool programs being ramped up, thought is precisely fully within the current domain of these Schemers. In fact that’s what education reform all over the world is really all about. And it is quite coordinated. And now finally it is becoming much better understood. Please join me in not going quietly into this Planned Vision. That needs to be radically restricted if not abolished root and branch. So said anthropologist Bernard James in his 1973 book The Death of Progress in a passage so reminiscent of Paul Ehrlich’s long-expressed desire to use education to create Newmindedness and James Burke’s to create Non-Axemaker Minds that I just HAD to borrow it. And for similar reasons too. See what I mean? And like the Bioregionalists and the Ecology educators like David Orr, it’s always the rational mind that is the central target for change. http://www.invisibleserfscollar.com/we-need-a-radical-change-in-our-mode-of-consciousness-even-a-new-sense-of-being-human/ . There was one modern scientific discovery and technological innovation though that didn’t send Professor James into a social engineering frenzy–the computer and communications technology. What today usually gets abbreviated as ICT or as the National Science Foundation likes to call it–Cyberlearning. As in let’s throw tens of millions of taxpayer dollars or new debt into making ICT the focus of all education. K-12 and higher ed. No Cronyism there. http://www.edweek.org/ew/articles/2013/01/03/15cyber.h32.html?tkn=TLLFZjQZBrz3EptDVf4qQPg2Wz33qWsMGN2A&cmp=ENL-EU-NEWS1 is the January 3, 2013 story called “Federal Effort Aims to Transform Learning Technologies.” Since I have written several posts where education professors and administrators and UNESCO reports explicitly acknowledged that such Digital Literacy efforts actually are designed to gain Equity in Achievement by limiting the ability to think, I decided to look into this expensive program further. The National Science Foundation’s Cyberlearning Initiative is very much in the Limit the Capacity to Think,Make Tool Use and Social Interaction the Purpose of School, Tradition. You know the one that has everything to do with taking down the basis for Individualism and free markets and disruptive technology innovation and nothing to do with the transmission of useful cultural knowledge from the past? Since that would bolster the rational mind and each person’s ability to conceptualize the future for themselves? Or be ingenious? Oh, but I am getting ahead of myself again. This 2008 NSF report that must have the tech companies salivating is called “Fostering Learning in the Networked World: The Cyberlearning Opportunity and Challenge: A 21st Century Agenda for the National Science Foundation.” That mouthful, which I quoted in full for a reason, goes a long way towards explaining the NSF’s agenda in creating all the poor math and science curricula in the 90s that became notorious in the Math and Science Wars. Which is important now as NSF also goes after higher ed courses to gain equity in credentialling. Moreover, it explains the education vision in both that USGCRP 2012-2021 report http://www.invisibleserfscollar.com/if-reality-is-ignored-or-disregarded-when-do-we-become-a-state-against-its-people/ as well as that troubling Research Goal 6 described in the previous post. And also NSF’s work on the Belmont Challenge and the Future Earth Alliance. Busy folks. In fact, “Altering Minds and Behaviors without Telling You” might be a good 21st Century motto for certain parts of the NSF. So convenient isn’t it that NSF now reports to a close Ehrlich colleague, John Holdren. He is not telling us either although if you read his past books and articles, he already has. Yes, long before Peter Senge took up the mantle of Systems Thinking to make a lucrative living foisting it on schoolchildren and naive business executives, we had Norbert Wiener who helped develop Cybernetics to try to make human systems more predictable and controllable. And, no, nobody EVER asks us “Pretty Please” or May I?”. So Cyberlearning is based on Cybernetics theories and involves Learning in a networked world. And the NSF report wants to make it quite clear that cyberlearning involves “learning with” the tablets, Smartphones, and laptops that are currently being pushed at great expense. Absolutely does not mean “learning about” the ICT infrastructure. Mercy no, that might bolster the abstract, logical mind and we need to prevent those as much as possible in the 21st century. No matter what the cost in dollars or forgone future prosperity or destroyed individual promise. In fact on page 11 of that report you can find a chart called “Advances in Communication and Information Resources for Human Interaction” that puts working with symbol systems like reading and math and academic content very low on the totem pole of 21st century aspirations for students. And what makes it to the top you ask reluctantly? Why, that would be “Virtual Observations [aka videos], Collaborations, Social Networking, and Web 2.0.” I kid you not. That’s the Marxist/Deweyan ultimate wish list of Social Interaction, Participation, and Engagement as the purpose of education. It also dovetails to the 1989 UNESCO agenda described here. http://www.invisibleserfscollar.com/values-and-vocational-creating-citizen-drones-via-education-worldwide/ . The report still guiding education “reform” globally. One of the creators of that chart is heavily involved with Cyberlearning and Informal Learning generally. Stanford Professor Roy Pea is not only in a position to “Do Lunch” with the Ehrlichs and Linda Darling-Hammond and so many other of our Transform Education Schemers but he was kind enough to do a Cyberlearning slideshow in 2011. That got uploaded on August 15, 2012 just in time for the new school year. http://www.slideshare.net/roypea/berkeley-cyberlearning-030811final . Have fun with the whole show but it is Slides 17-19 that really caught my eye. They make it quite clear Professor Pea considers ICT and Cyberlearning to be a Lev Vygotsky mediated tool. Complete with pictures. Vygotsky, for newcomers, was a Soviet psychologist determined to use pedagogy and education to create the perfect Soviet man (and woman I am sure). He understood that cognitive tools can either strengthen the abstract mind (like reading phonetically) or weaken it (like ICT substituting for personal knowledge). Slide 19 leaves no doubt in my mind Professor Pea very much understands what Vygotsky aspired to do in his research. Disrupt previous cultural-historical processes [also known as knowledge of the past] in favor of something new. A different future and culture. As in Designing New Minds, Values, and Overall Personalities I suppose. And Pea also leaves no doubt (Slide 49) that the expensive National Education Technology Plan is part of all this mind-weakening, Transformative, Design a New Future through the introduction of new Cognitive Tools, assault. Designing the Future. Now how hubristic, as in Will Lightning Strike at the Nerve?, does that sound? But sure enough, on January 18, 2012, there was a Cyberlearning 2012 Summit in DC we were not invited to. So we will have to rely on this helpful graphic of what went on. http://cyberlearning.sri.com/w/images/b/b9/Illustration_Banner.jpg . And there on the far left we see “People and Technology Working Together Designing the Future.” Apparently all it takes according to the graphic is the NSF using multimillion dollar grants to bribe educators and institutions who will in turn Transform Education. Making ICT and the Internet and the Visual instead of mental the Whole Point of Education. Well, that will affect the future as we shut down much of the human capacity to think rationally that brought, quite literally, Civilization. Print and the mental manipulation of it played a big part. Especially after the invention of the printing press and the Reformation made literacy widespread in the 16th century. Leading to the explosion of knowledge and technology Bernard James wanted to stop in our title. But can we really design the future? I don’t think so. But let’s talk about that latest bit of public sector hubris in the next post. We will look at what Ehrlich and UNESCO and the European Union and NSF all have in mind when they talk about Foresight Knowledge. Because I am a firm believer that forewarned is forearmed. Especially about Foresight. Going through the actual Performance Assessments in the last post reminded me of what a useful mind altering and emotion manipulation tool they will be for someone like Climate and Population Alarmist Paul Ehrlich. Ehrlich has long wanted http://www.invisibleserfscollar.com/learning-to-learn-or-how-to-replace-old-minds-with-sustainable-new-ones/ to use education to “change the way we perceive the world, the way humanity sees the world in order to survive.” But I did not know when I wrote that post that both he and the US Climate Change Aspiring Professional Bureaucracy and Collection of Rent Seekers would publish reports that came out late last week. Just full of plans on how to use education to physically change minds and arouse emotions to support their lucrative “research” agenda. Which sounds to me like the kind of aspiration likely to produce civilization collapse as all sorts of unappreciated reasons that things work at all get punted in the name of wholesale Transformation to “reduce humanity’s ecological footprint and social inequities before it is too late.” Collapse triggered by computer modelling by rent seeking parasites determined to ignore reality in their lust for power and money or just naivete. http://www.dailymail.co.uk/news/article-2261577/Global-warming-stopped-16-years-ago-Met-Office-report-reveals-MoS-got-right-warming–deniers-now.html?ito=feeds-newsxml came out over this weekend directly on point. Only someone without a knowledge of history or economics could advocate deliberately redesigning and changing all those things and proclaim it is to avoid civilizational collapse. It’s much more likely to bring it on as all the factors that create human progress and prosperity get targeted for gutting to enable widespread submission to such schemes. Ehrlich even calls these changes via education a “soft means” to advance public policy but the landing is likely to be quite hard. Laying out the fellow international players does not help. It just adds to the toxicity of the brew being hatched to use “social science and humanities” to sway minds by metaphorically lobotomizing them. Which brings me to the http://ncadac.globalchange.gov/download/NCAJan11-2013-publicreviewdraft-chap29-researchagenda.pdf National Climate Assessment draft released by more aspiring Planners and Permanent Rent Seekers last week. The US Global Change Research Program was already on my radar screen for its “You will Believe This No matter What the Actual Facts” Attitudes in previous reports. http://www.invisibleserfscollar.com/if-reality-is-ignored-or-disregarded-when-do-we-become-a-state-against-its-people/ I wish taxpayer funded agencies in supposedly free countries did not behave in ways that provoke descriptions previously used for the Soviet Union. But the Soviets too were quite consumed in using education to limit the likelihood that citizens had the mental capacity or store of accurate information to challenge the plans of the nomenklatura. So the analogy is unfortunately apt. Education, K-12 and higher ed, used to be about empowering each of us as much as possible with the knowledge of what worked, or didn’t, in the past so we could make good decisions as adults about our own lives and what we valued. No more. Now it is apparently about hobbling our ability to be independent so we will surrender “decision-making” to others. And we won’t mind or even notice. Now once again. Where is the likelihood of collapse really coming from? Such a future capacity general focus for all students instead of fixed content knowledge would not be politically popular. Parents and taxpayers and non-politically connected future employers would likely rebel from such Mind Arson via taxation and tuition. So of course the Parasitical Class of too many professors and education administrators and vendors who want both their inflated salaries and pensions AND political, social, and economic Transformation simply lie to us about what is really going on. Once a controversy develops, we get new names and severed parts but usually not real changes in practices. So when the Future Empowerment Paradigm associated with Transformational Outcomes Based Education and William Spady in the 90s (described here http://www.invisibleserfscollar.com/future-empowerment-paradigm-or-educentric-tradition-guess-which-began-its-reign-20-years-ago/ ) became controversial, the critical End Game of Life Role Performances got severed. Keep the function. Change the Name. Hire someone other than Spady. Now it is very difficult for the public to get their arms around just how much scheming and looting and psychological manipulation is going on in this Change the Student Future Capacity Template. When they hear terms like “Performance Standards” they automatically think solid academics at a high level of expected expertise. When they hear Performance Assessment, they think testing that expects solid academic achievement. They certainly do not think of an education model doing everything it can to take mental activity out of the classroom. They would be horrified to know performance standards are all about creating desired behaviors and attitudes in each student at a reflexive level. No conscious thought required. John Dewey called that type of problem the Indeterminate Situation and valued it greatly because it required emotion and frustration instead of intellectual skill and knowledge. He believed such problems were conducive to striving for a different kind of society instead of accepting the capitalist, individualistic society he abhored. Today’s assessment developers still have a similar intent even if the Principals or teachers themselves are unaware of the history of this peculiar notion of rigor to drive revolution via mental and emotional transformation over time. So Transformational OBE and Spady became too controversial in most places to acknowledge when that was what was going on in a school or district. So those Life Role Performances got renamed as Performance Assessments and less well-known OBE players like Spence Rogers or Willard Daggett pursued the OBE implementation via their focus on actual classroom activities. All of the activities quoted came from the Third Edition of Spence Rogers’ book The High Performance Toolbox:Succeeding with Performance Tasks, Projects, & Assessments. Those tasks, projects, and performance assessments are what drives the actual classroom implementation of every Common Core curriculum I have seen. The Schemers know that what is measured is what gets taught. So the Future Capacity/Empowerment/New Kind of Focus comes in under the poorly understood Performance assessments. Where the task or project is the evaluation. And the task or project is not checking content knowledge but looking for action and generic abilities like the ones described above. This would all be hard to spot unless you were monitoring curricula all over the world and over decades. Which I have. The future capacity orientation gets hidden also in the US under the lovely euphemism College and Career Ready. 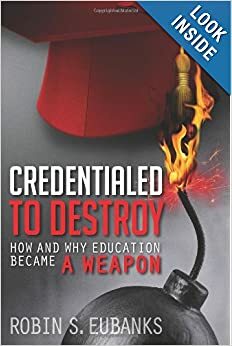 Sounds like knowledge but avoids the “entrenched subject matter” orientation of traditional education that bolsters those undesirable (if you want state control of society and the economy) Axemaker Minds. Why you say? You know if ten years from now we continue on our present trajectory I will likely be forced to write a book explaining that the US and the West lost prosperity because too many of the beneficiaries of capitalism never understood how much individual and cultural attitudes and values mattered to economic prosperity. And ALL the anti-capitalism schemers knew precisely how much these mattered. And they used education, K-12 and higher ed, to get at and change the attitudes and values of independence and self-reliance. And they used education to force out every aspect of the curriculum known to nurture the rational, logical, conceptual mind. Which is the real reason for the math and reading wars. It’s not about how to teach. It’s about limiting the oxygen that ignites the fires of individual mental cognition. That useful ability to spin your own mental scenarios within the privacy of your own mind. Scenarios that can sometimes turn into innovative inventions that alter the known world. Like the Axe did or the computer. Throughout history and even today in most countries in the world the political sovereign–whether king, dictator, or legislative body and state-employed bureaucrats–controls the economy. That’s the historic norm. What is going on in education in the US now and globally is simply a stealth reversion to that norm. Ironically the changes are frequently being done under the banner of becoming or remaining Internationally Competitive. Yes in the sought Dirigiste, Mercantilist economies of the 21st Century where Education is the Method of Personal Subjugation. And Catastrophic Manmade Global Warming and the spectre of other planet-wide environmental disasters is the Excuse for such planning and control over economies and people’s personal behaviors. And politically connected businesses hope to benefit as well. If the Statist Schemers living at our expense were honest about what is going on most of us would say No. Freedom may be a burden but it is a burden most of us desire if given the choice. So we are not being given the choice. And education seeks to become a walled-off profession where no one but the Properly Credentialled may have a say. And the Credentials are grounded in the Marxist political theories that caused so much destruction in the 20th century. And yes I am quite sure about that as well. It’s also why CAGW, like Marxism in its heyday, must be treated as the unexamined Theory never to be contradicted with reality. Like Marxism or Dewey’s Social Reconstruction, it’s an aspirational theory for changing the future not a scientific theory based on facts. None of these political theories for social control can bear the scrutiny of reality because that is not what they are grounded in. But reality is still the world every one of us inhabit. And it thus has to govern how we respond to all these sought changes. It’s the reality behind the current “Grab the Guns, Gut the Mind, and Ignore the Temps” that too many are still treating as unrelated. 19th Century Blueprints for 20th Century Tragedies: Is a Repeat Pending in the 21st? I would be willing to bet virtually everyone reading this post is familiar with Harriett Beecher Stowe’s book, Uncle Tom’s Cabin. The little lady who started that big war is I believe how Lincoln described her and the book. Yet the second biggest bestseller in the US in the 19th Century, Edward Bellamy’s influential and chilling utopian novel Looking Backward: 2000-1887 is virtually unknown now to most of us. That’s a problem as we evaluate where education is really going and what it hopes to accomplish now because virtually everyone I have ever written about on this blog from Professor Fecho in the last post to the Best Practices book detailing the Standards for Teaching and Learning to Bill Ayers or Nel Noddings or John Goodlad or Ralph Tyler and his 8 Year Study all agree on one thing across the decades. They are implementing John Dewey’s vision for using education to transform the nature of American society. So what drove Dewey and influenced his vision matters as his work is still being cited as the inspiration for what is being pushed in 2013. What if we know many things now that Dewey did not know when he wrote in the late 19th and early 20th century? Shouldn’t those things matter to whether his education vision is likely to produce a toxic society and economy in the 21st Century? Can’t we learn from history? The Bolsheviks in 1918 in Russia spent precious hard currency having Dewey’s works translated into Russian before Lenin had even prevailed in his Revolution. Should the other things they wanted that were so harmful give us pause that they viewed Dewey as an ideological comrade? Or that Mao in the 1920s cited Dewey as hid favorite philosopher? Shouldn’t that make us uncomfortable in 2013 on whether we should be blindly implementing his vision? In 1935 John Dewey put Looking Backward second to Marx’s Capital on a list of the most influential books of the past 50 years. Two Dewey biographers, Robert B Westbrook and Alan Ryan, write about how much Dewey was influenced by Bellamy’s vision of the future. Please remember when both Bellamy and Dewey were writing, the US and Europe were going through the “coming of technological, urban society” which I believe can accurately be described as the “most deep-seated and sweeping transformation of human affairs in all of recorded history.” That sounds dramatic but these were hugely uprooting, unprecedented changes that must have been bewildering and alienating to live through. Dewey and Bellamy’s writings reflect that. But we now know much that they did not. Shouldn’t our knowledge of what happened in the 20th century chasing after collectivist ideas matter in the 21st? Especially since what is sought is so strikingly similar? Looking Backward (I am using Ryan’s description of the book as an admirer of Dewey to be fair) involves a well-to-do man put into a hypnotic trance in 1887 who awakens in 2000. “In this Boston poverty has been abolished, and absolute equality established. ” The book envisioned a 2000 where there is “no politics, no money, no free market, and no social disorder.” Every citizen of the country, regardless of age or occupation receives the same income and all commerce has been replaced by a system of direct distribution of goods and services. Looking Backward sells the idea that economic competition is wasteful and central planning allows for vastly superior productivity. From our 21st century vantage point we know from the miseries of the 20th that central planning is not more productive. It is hugely wasteful because so much critical information never makes it through. And that’s apart from the political capture by crony favorites that is inevitable in such a system. That marvelously creative and innovative fertility and facility, plus a tremendous amount of useful knowledge that will no longer be transmitted via schoo,l is what is being jettisoned in 2013. By professors and politicians and Supers and Principals trying to still implement Dewey’s dream and collectivization and central planning. For them, it is either that the 20th Century’s tragedies never occurred or a belief that supercomputers and an ignorance among the masses on what is being changed via the schools will make all the difference this time. Capitalism is actually a term created to be a pejorative. An insult. Propaganda. I like the idea of economic historian Deirdre McCloskey of substituting phrases like “continuously emergent novelty” or the “explosion of consensual creativity” to describe what makes free markets so conducive to prosperity. If we make the rules regarding contracts and property law fixed instead of trying to fix outcomes and then get out of peoples way, history shows a natural tendency for human betterment that benefits everyone to some degree. We really should think twice or more about the determination to shut this all down in the name of Equity and democracy and social justice and fairness. Marx and Bellamy and Dewey could not know that. But it is part of the historic facts available to us in 2013. Yet these ed reforms and the economic and social vision that goes with it ignore these facts. Wagner and Schmoller were tragically wrong but we still seem to be pushing comparable ideas today. Why are we ignoring so much historical and economic fact as we once again chase after impossible utopias? What Happens When Repeated and Intentional Threats to Student Beliefs Becomes Mandated? That provocative title based on an urgent concern we should all be pondering comes from this quote from an Education Professor credentialling who can teach or be the boss. All at taxpayer expense based on an unappreciated definition of Literacy being imposed everywhere now on classrooms under the Common Core ruse. “My sense is that all learners need their belief structures to be routinely threatened in ways that move them to interrogate those beliefs. To do otherwise is to deny the opportunity for my students, my colleagues, and myself to teeter on that fulcrum of threat and, using our collective weight, to defy the gravity of our circumstances. Now, this acknowledges these methods constitute threats to a student’s sense of self that will be painful for some students and teachers. And it acknowledges trying to create mental approaches that students will remain in as they journey through life that may well repudiate the Mindset brought from homes with educated, involved parents and lots of books and conversation from birth. And it acknowledges that the desired classroom is about encouraging teachers and students to be theorizers–“creating theories about how the world operated, testing those theories, and reassessing” without regard to facts or history or reality. If this is the school and classroom experience you advocate Educators impose, should you immediately write a Op-Ed after the Newtown tragedy complaining that there is something wrong with Upper Middle Class White Students and the US needs gun control? http://blogs.ajc.com/get-schooled-blog/2012/12/21/fearing-young-black-men-in-hoodies-while-ignoring-while-young-white-men-with-glocks/ is the editorial before Christmas that really struck me as propaganda for the paper that published it. I have chronicled all the social and emotional targeting of students and the repeated rational, abstract mind attacks. Those are not well-known to the public at large but they seem well-known in the Colleges of Education. That’s where they get created and a willingness to be a blind and deaf advocate for them earns Masters and Doctorate degrees now in too many places. The fact is that these largely White Middle Class communities and schools that have been the location of school tragedies also are places that all seem to be piloting the Affective, Change the Student Approaches instead of the historic Transmitting of Knowledge. This fact is quite well-known among the education professorate. It’s the public that fails to see the connection among Flow experiences, Transformational Outcomes Based Education (both are described in the previous post), Systems Thinking, or the Best Practice/Standards for Teaching and Learning that I described here http://www.invisibleserfscollar.com/didnt-the-president-just-admit-ccssi-was-a-ruse-to-change-classroom-interactions/ . This paragraph is an aside to this post but it may well be enlightening to some of you on how this gets in place. Plus I try to be fair here. We are dealing with troubling or bad ideas on this blog and not people themselves. I would classify Professor Fecho’s work as well as his UGA colleague Peter Smagorinsky as being part of that Standards for Teaching and Learning approach. Their theories of pedagogy and Literacy suggest that UGA was not just interested in constructivist math when it took a huge NSF grant of $10.3 million in 2002 to set up a Center for Learning and Teaching. Lucky Georgians were getting the Whole Language/Psycholinguistics approach to reading and writing as well as part of Georgia’s piloting of the Performance Standards that would in turn become the basis for the actual Common Core implementation now going national. And really catching up to the international initiative being pushed globally through UNESCO. This matters to me and maybe you too, for example, because it explains why the description of Common Core sent out at the beginning of this school year by high school English teachers did not match what I know about the Common Core and those teachers. They had a new Department head with a UGA Masters in Reading who would have been influenced by Fecho and Smagorinsky’s politically inspired approaches to teaching. She is now an Assistant Principal about a year after joining the school as a teacher. See how advocating certain theories creates a fast track to lucrative promotions? See how all this can affect your child’s classroom or just your community school out of site? In the nicest neighborhoods? Which is the whole idea. No islands of academic knowledge and minds burgeoning with accurate facts and logic are to be allowed. Anywhere. Back to this post’s concern over what has really been transpiring in many classrooms. It is now to be a national mandate in the name of the Common Core with requirements imposed for schools to remain accredited. Professor Fecho himself advocates a classroom approach for adult and younger students he calls creating “an atmosphere where wobble takes place.” http://www.cocostudio.com/pubs/Fecho-July10_EE.pdf is the 2010 article from English Education that explains the wobble process and the desired “shift in balance” in a student’s belief system. Later (page 429) the article cites Soviet philosopher Bakhtin and politically radical educator Paulo Freire for this theoretical view of Self. It is not a factual view of Self but a political aspiration for accomplishing what everyone involved admits is a radical economic, political, and social Transformation. In other words, this is not about how to teach subjects but how to transform enough students from the inside-out to use the majority electoral process to impose a New Vision for the future. On all of us. Key to that is treating the student’s identity as not settled. So that the classroom curriculum and activities become a means of creating continuous “centripetal and centrifugal tension” on a student’s personality. That seems to be a fancy way of saying pulling it apart from every direction. The stronger the personality and mind that walks in the door of one of these soon to be increasingly prevalent classrooms, the harder this type of classroom experience will be. For a sharp mind this highly psychological emphasis makes the school anything but a safe zone. If it was me as a teenager, I would see the process described above in the opening paragraph or the wobble push as turning school into a torture chamber. Forcing teachers to go along is a huge part of of these Effective Teacher Evals you are hearing so much about. See http://www.invisibleserfscollar.com/coercing-teachers-to-be-social-and-political-saboteurs-what-can-be-done/ for more on the Eval Coercion and why. I delayed posting a few days on this so I could read Professor Fecho’s book “Is This English?” Race, Language, and the Culture in the Classroom to make sure I was being fair. The title and opening quote comes from that book (page 146 to be exact). I am not going to second guess the Professors belief that this was a good approach in an urban Philadelphia classroom with minority children that seemed disengaged from school. I am saying that the insistence on Equity and Levelling and eliminating the Axemaker Mind anywhere it appears means that school in some of our suburbs became and is becoming a place where teachers are being forced to push theories and psychological practices that already have a tragic history. They may be unfamiliar with the background of these theories and practices but we are not any longer. The creators of these theories and practices want Change in students mentally and emotionally and what they value and believe in going forward. They want those changes to gain a Collectivist oriented political and economic future. This time it is supposed to be “humane” socialism with politically connected amenable Big Business allowed as Collaborators with this Government Led and Enforced Vision. I don’t think it will work well. Most people will be looking at a much lower standard of living in the future with less differences among us. That’s a high price to pay for Equity. No more widespread prosperity. I genuinely believe that the “inexplicable” school shootings of the last 20 or so years in the US are too consistently tied to places that are cutting edge in pushing these transformative theories in the classroom for it to be coincidental. School ceases to be a place of safety when the intention is to create something akin to wobble. Deliberately trying to break the mind brought from home. Intentionally using education to mount a political coup by stealth may avoid the Gulags that were necessary elsewhere. But this education theory approach has not been without victims. If these theories and practices become nationalized as planned, I fear these tragedies may become more common. The answer is to first stop this psychologized, mentally abusive and emotionally intrusive political classroom. Not to insist that everyone must be disarmed so that guns and rational minds are both being deliberately taken away by what amounts to government fiat.